ASGARD aims to create LEA Technological Autonomy, by building a sustainable, long-lasting community form the LEA and research and development industry that will created (at little or no cost to LEAs), maintaining and evolving a best of class tool set for the extraction, fusion, exchange and analysis of Big Data including cyber-offenses data for forensic investigation. ASGARD will help LEAs significantly increase capabilities. With forensics being a focus of the project, both intelligence and foresight dimensions will also be tackled by ASGARD. 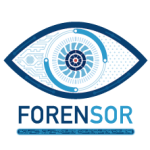 The FORENSOR project aims to develop a novel, ultra-low-power, intelligent, miniaturised, low-cost, wireless, autonomous sensor (“FORENSOR”) for evidence gathering. The combination of built-in intelligence with ultra-low power consumption will make this device a true breakthrough for combating crime.